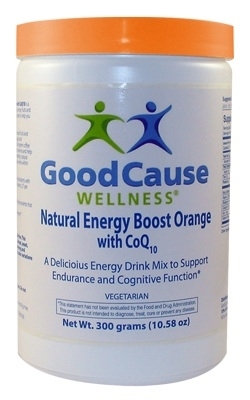 Good Cause Wellness Energy Lift Orange with CoQ10 blends some of nature’s most nutritious orange fruits and vegetables to provide you with a boost of sustainable energy. Natural energy boosters like green coffee bean extract, ginseng and the amino acid taurine increase stamina and help your body function more efficiently. What is CoQ10 and what does it do? CoQ10 is an important, natural antioxidant that improves energy and stabilizes blood sugar levels. CoQ10 is found in every cell in your body. It plays a vital role in producing energy in the mitochondria, the part of a cell responsible for generating energy. Which orange fruits and vegetables are used? The fruit blend includes oranges, peaches, nectarines, tangerines, cantaloupe, pineapple, clementines, papayas, apricots, mangos, kumquats and persimmons. The vegetable blend includes yams, pumpkin, carrots, butternut squash and rutabaga. These orange fruits and vegetables provide sustainable energy due to the combination of natural sugars and carbohydrates, protein and fiber. What are the benefits of Energy Lift Orange with CoQ10? This blend of orange fruits and vegetables supplies a natural source of sustainable energy. Energy boosters like green coffee bean extract, white panax ginseng, taurine and inositol increase stamina and help your body function more efficiently. CoQ10 improves energy levels by promoting energy production at the cellular level. Taurine is an amino acid that is naturally produced by your body and works to regulate heartbeats, muscle contractions and energy levels. Inositol is part of the B vitamin complex and is closely related to choline and biotin. It helps the body use fat as fuel and lets muscles, including the heart, contract more efficiently. CoQ10, a natural antioxidant, stabilizes blood sugar levels. Green coffee bean extract also helps regulate your body’s metabolism. Korean white panax ginseng is an adaptogenic herb that helps adrenal glands better manage production, storage, secretion and elimination of stress hormones. DMG HCl supports mental alertness and brain function. Energy Lift Orange provides 3000 ORAC units per serving. Green coffee bean and CoQ10 have powerful antioxidant properties. Taurine, an amino acid that your body naturally produces, is also a strong antioxidant. Vitamin C and beta-carotene, supplied by the orange fruits and vegetables, are also effective antioxidants. Green coffee bean extract increases stamina by stimulating production of cortisone and adrenalin. Does Energy Lift Orange with CoQ10 contain caffeine? As a dietary supplement, mix one rounded (10g) scoop in six to eight oz. of cold water or juice, one or two times daily. All fruits and vegetables in this product are pesticide free. This product is vegetarian and free of egg, gluten, milk, wheat, yeast, added sugars, starches, synthetic dyes, artificial flavoring and preservatives. Color of this product may vary due to color variations of the natural ingredients.